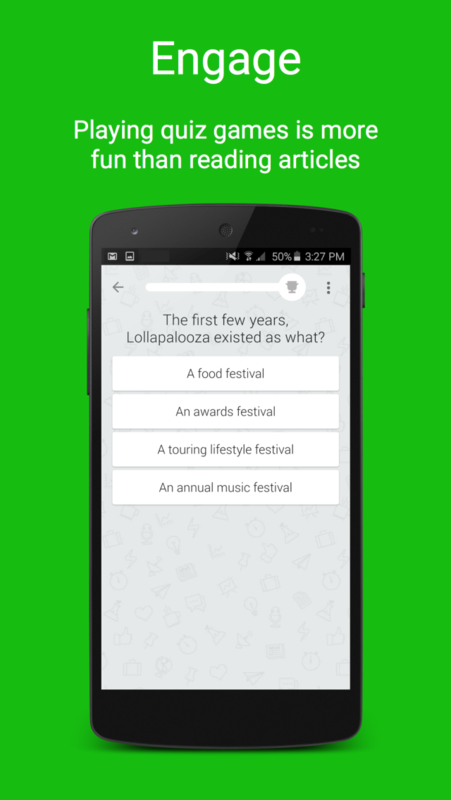 Trust us, Kibbit is not just your average, run-of-the-mill trivia app. It feels like a game, but you’ll learn cool facts about whatever topics you’re interested in under 5 minutes. Oh yeah, it’s totally free and without no ads! Picture this, You’re making your way through a party when suddenly someone asks you about that presidential candidate you had heard about once upon a time. Lucky for you, you used Kibbit. You knew exactly who they were talking about and all the key policies by taking a quiz that took you less time than drinking a piping hot cup of coffee. 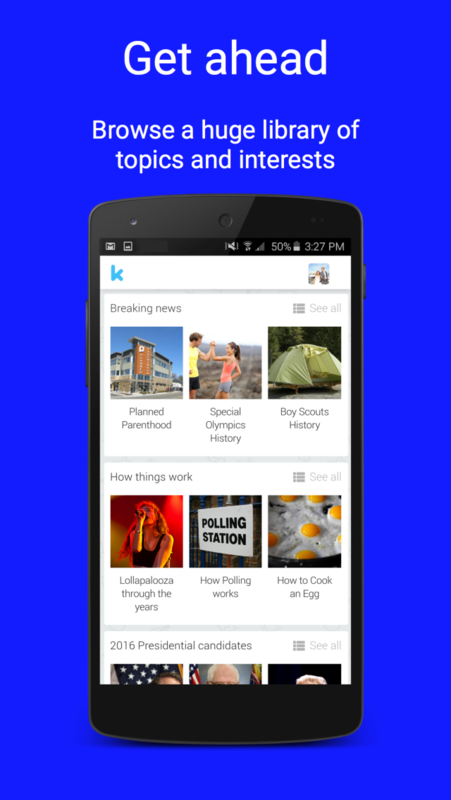 When you start playing Kibbit, you can follow the topics that interest you -- we have over 50. 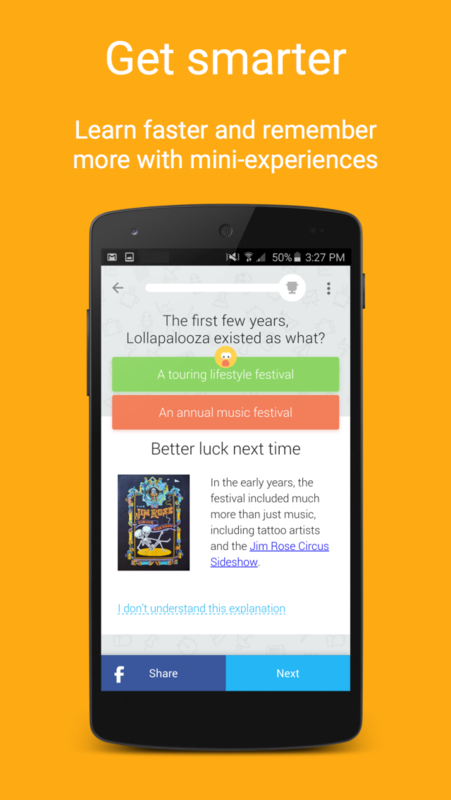 You’ll get personalized recommendations to discover new topics so you’ll keep learning new things that interest you. Research shows that this kind of interactive quizzing helps you learn better and faster than your average article. In under 5 minutes, you’ll be smarter and know new fun facts about interesting topics. This works great as a party game, or you can share fun facts and compare scores with your friends on Twitter and Facebook. GIVE US A TRY! SEE WHAT YOU KNOW. SEE WHAT YOU CAN LEARN! But trust us, there’s so much more. Find out for yourself. Excited by what we’re building? Ideas for how to make it better? Problems with the app? Please let us know so we can make things better for everyone! Just drop us a note at feedback@kibbit.com before you rate us. We really appreciate it! We know there’s more to learning than just quizzes, so follow us on Facebook and Twitter for links and advice on more resources. If you find it helpful, don’t keep it all to yourself, share with your friends! Kibbit: Get smarter in under 5 minutes. Learning that’s fun and free: Trust us, Kibbit is not just your average, run-of-the-mill trivia app. It feels like a game, but you’ll learn cool facts about whatever topics you’re interested in under 5 minutes. Oh yeah, and it’s totally 100% free. See the difference: Picture this, You’re making your way through a party when suddenly someone asks you about that presidential candidate you had heard about once upon a time. Lucky for you, you used Kibbit. You knew exactly who they were talking about and all the key policies by taking a quiz that took you less time than drinking a piping hot cup of coffee. Personalized topics: When you start playing Kibbit, you can follow the topics that interest you -- we have over 50. 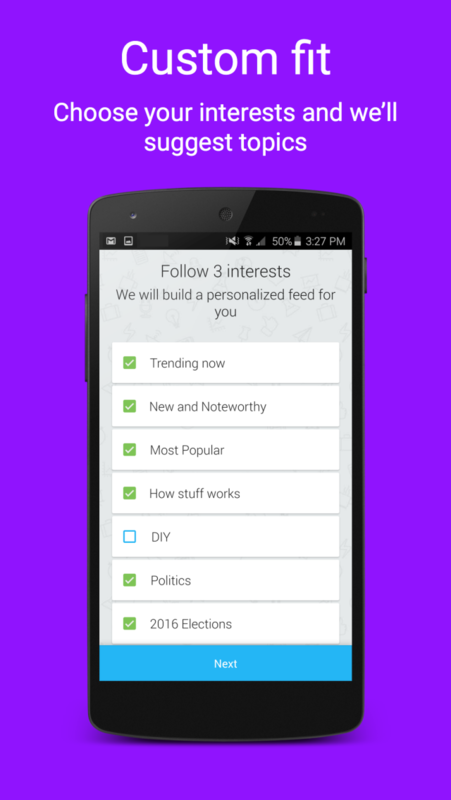 You’ll get personalized recommendations to discover new topics so you’ll keep learning new things that interest you. An approach that works: Research shows that this kind of interactive quizzing helps you learn better and faster than your average article. In under 5 minutes, you’ll be smarter and know new fun facts about interesting topics. You can make your friends smarter too: This works great as a party game, or you can share fun facts and compare scores with your friends on Twitter and Facebook. Give us a try! See what you know. See what you can learn.